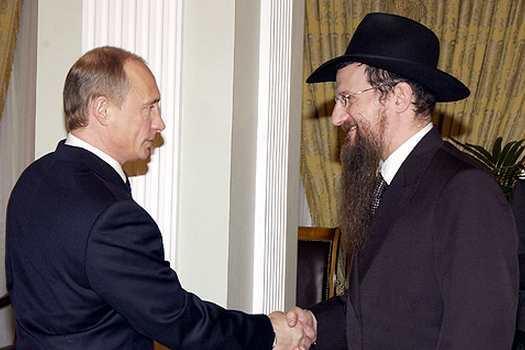 File photo: Rabbi Berel Lazar with Russian President Vladimir Putin. When even Russian policemen had to pass security checks to enter the Sochi Winter Olympics, Rabbi Berel Lazar was waved in without ever showing his ID. Putin’s relationship with the Jewish community is consistent with his larger strategy for governing Russia. His brand of Russian nationalism extends beyond just ethnic Russians to include the country’s many minorities. Putin has carefully cultivated relationships with Russia’s many subgroups and regions as a means of projecting his government’s authority. Another influential Jewish figure for Putin was his wrestling coach, Anatoly Rakhlin, who sparked the young Putin’s interest in sports and got him off the rough streets of Leningrad, where Putin would get into fights while his parents worked. At Rakhlin’s funeral last year, Putin, reportedly overcome by emotion, ditched his security detail and went on a short, solitary walk. Putin, who already led Russia to sign a visa waiver program with Israel in 2008, said during his visit to Israel that he “would not let a million Russians live under threat,” referring sympathetically to the regional dangers facing Israel and its Russian-speaking immigrant population. But at the same time Russia has criticized European sanctions on Iran, a major Russian trading partner, and negotiated the sale of the advanced S-300 air defense system to Syria. In Israel, Putin received a guided tour of the Western Wall from Lazar, who joined Putin’s entourage — vividly illustrating the president’s close ties to the Russian branch of the Chabad movement. Zvi Gitelman, a professor of Judaic studies at the University of Michigan who studies the relationship between ethnicity and politics in the former Soviet Union, said the relationship between Putin and the Chabad organization in Russia is one of mutual convenience. 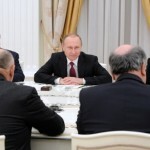 Shortly after taking office, the Putin government clashed with several prominent Jewish business moguls, including Vladimir Gusinsky and Boris Berezovsky, both of whom went into self-imposed exile. Chabad, meanwhile, has expanded throughout Russia. “Chabad, with the help of Putin, is now the dominant religious expression of Judaism in a mostly nonreligious population,” Gitelman said. Putin has not been shy about using his good relations with Chabad to his advantage. 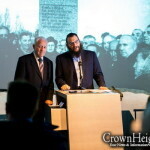 Last year, he moved a collection of books known as the Schneerson Library into Gorin’s Jewish museum in an attempt to defuse a battle with the global Chabad movement. Chabad’s New York-based leaders had demanded the library’s return, which had belonged to one of its previous grand rabbis, but Russia has refused to surrender it. The compromise was rejected by the Hasidic movement’s headquarters but defended by its Russian branch. Other Jewish groups, however, have had less cozy relations with the Putin government. In 2005, Rabbi Pinchas Goldschmidt, the chief rabbi of Moscow, was suddenly denied entry into Russia for several weeks before he was allowed back into the country, where he has resided since 1989. No official explanation was given, but it was rumored that his banning was part of a power struggle that saw Chabad-affiliated rabbis emerge on top. 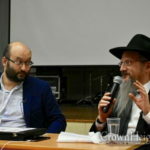 The preferential treatment of Chabad by Putin’s government “is creating a monolithic Jewish institutional life and preventing grass-roots development, which is the real key for Jewish rejuvenation,” said Michael Oshtrakh, a leader of the Jewish community of Yekaterinburg. Well, this is an improvement for the JTA, which–unlike the rest of the world’s media–never failed to throw in a “Lazar, one of the FSU’s two chief rabbis” every time they mentioned Lazar. The fact is that Berel Lazar is the man with the title of Chief Rabbi that actually means something, because he does something and commands a vast organization that does something. The other guy, I’m sorry to say, has little more than an office and a phone. The JTA has never missed a chance to hurt Chabad in their stories. Now they’re going after someone who has indeed been more friendly and helpful to Jews than any Russian leader before him. In the western world Putin’s being attacked for safeguarding Russian nationals in an area that once belonged to Russia and where most people wish to. He’s someone who Jews should appreciate and work with and his stand for traditional family values should make decent people notice.